Displays are an important part of every retail business and highly acknowledged universally. A display when skilfully done is sure to fetch customers as well as profits. Every prospective retailer would want to cultivate this art to infuse life in his products but this requires a degree of passion, creativity and skill to carve out something new and unique which may captivate audience attention and turn him from a window browser to a buyer. Visual merchandising commences right from frontage of show-room to its store lay-out, interior designing, interior displays, and other cosmetic additions. The foremost element of display in a show-room is its forefront. The entrance reflects the aura of the store and presents a snapshot of the merchandise available inside. Design a distinctive logo of the showroom and play it atop the forefront. Print it over your products and packages, vouchers and cash memos. The objective of display is to drive the audience to merchandise column. It is imperative that the guests step in, or else they would never tend to buy. The display should therefore, be so eloquently designed that it instinctively draws audience to the merchandise column. Goods displayed artistically and positioned on mannequins may tempt customers to get into the show-room and buy products of choice. The store layout and design are the most critical element to impress audience of its organised unfolding of goods by the browser. The store should be organised in a logical and systematic order that may help the guests to browse, look through and decide which items to buy. The room settings ought to be done in highly visible focal areas positioning products in convenient locations where the customer may grab goods conveniently. And once the store is set, don’t rest, give it re-looks occasionally with customer’s perspective and bring about necessary changes. A wide array of trendy, fashionable goods ought to be displaced and sold through knowledgeable salespersons within a logical price range. This shall boost the image of showroom and raise sales. Choice of colours is a vital tool in the visual merchandising. Colours attract attention and pull customer into the store. Colours can be associated with occasions, gender and emotions. 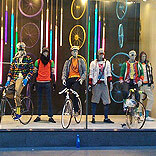 A retailer should focus on the right choice of colours that may match with the theme of display. Such as, Valentines theme may be coloured in red, pink and white, and the Christmas in red, white and green colours. Retailers should devise themes for specific items sales. A trendy theme may lure customers into a shop for impulse buying. Retailers may carve out themes as per their imagination and creativity in sync with season, festival or events. Such as, a shoe store can theme on a group of elves buying shoes, whilst an apparel store may theme on his mannequins posturing audience. Changing arrangement of displays on regular intervals shall create new interest about the products in the minds of the customer. Effective lighting system adds to the aura and ambience of the store. Adequate lighting can help show off your products' "best side", which enhances mood of buying. The outlet bearing an immaculate appearance is the foremost point in visual display. A beautiful display can be ruined by a cracked signboard or an unclean environment. Spruce up and clean up showcases and fixtures regularly. So in case you wish to ramp up the sales and increase the footfalls of your store, put these practices in place.